Slow and steady. Started out with a downpour, then light rain then just a nice early morning. Cooler morning, which is always nice. Heavy legs but overall run went well. Humidity was back.. felt ack... oh well. but on the bright side my legs felt decent this morning :) I do not say that much these days so I will take it! Wow a difference a day or two makes... 55 this morning :) However. The legs were heavy! Good morning. About 64 and felt decent after the first few slower miles. I have been actually eating healthy for 3 weeks now and I can tell it makes me feel better. Don't get me wrong, I still enjoy a nice steak ;) . I just have been fruit heavy in the am, lots of fruit smoothies with Whey and fish/meat heavy in the afternoon/pm. It is a type of Paleo diet, not trying to lose weight, just trying to stay injury free and get some miles back under me. Getting ready to go to the Greene and go shopping with my soon to be 13 year old. On the road for work... 6 miles in Mt Carmel, interesting hills. We earned this one. 74/75/96%. WET and just tough conditions to have a long run. Two in the group struggled but I kept them slow and steady. I told them after it won't get any harder than that. 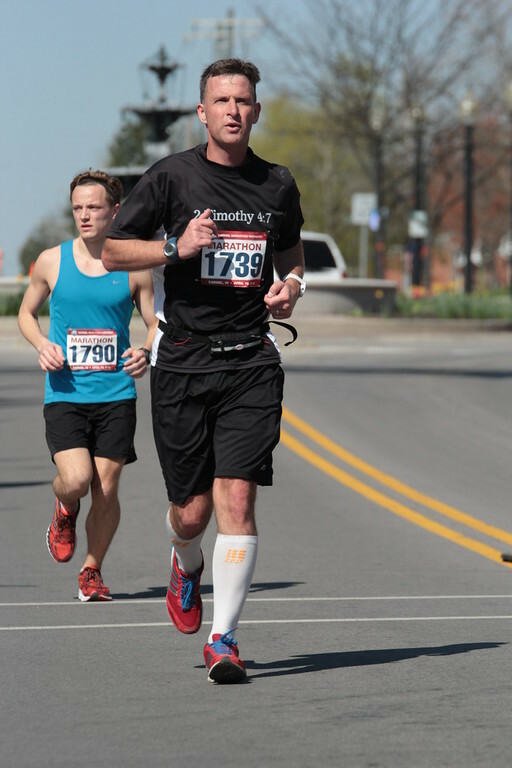 For me, that was the 3rd straight 20 mile Saturday. Next week we will back it off. That being said my total mileage is still low. I still want to build up slowly as I am totally coddling my way back. I figure slow is better than not getting any running in. We'll see how the body holds up in 3 weeks as I take them slowly on the 26. They maybe up my training to push a little pace at Indy in Novemeber.